Oh look at that, a finished Company Champion. This means that the Second Company Command Squad™ are totally done and dusted. Hurrah! Pretty happy with the end result of good old honoured brother Gaius. Once again the Forgeworld transfers help boost the final look, I really love how the repeating ultramarine symbol works wrapped around his shoulder pauldrons. 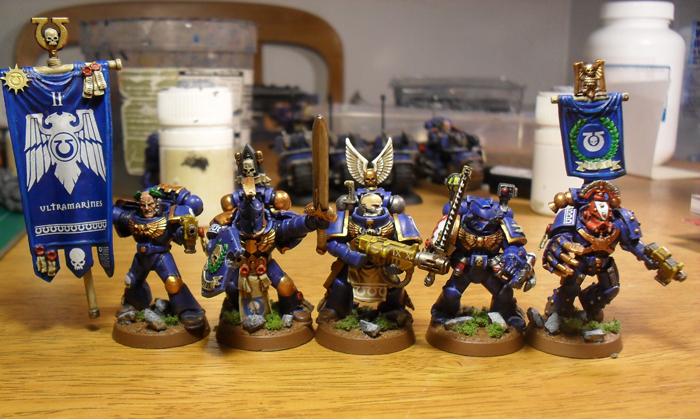 Just look at that command squad in all their blue/gold glory. 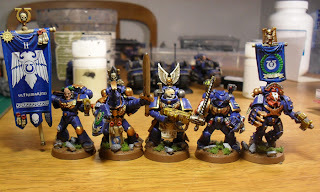 Nothing says 'we are the generic noble poster boys' like the Ultramarines colour scheme and I love it. Next up: whatever takes my fancy.